Learn to cook tortillas is something basic when learning Mediterranean cuisine but when starting is always a bit of scary, specially on knowing when it's ready (without waiting for the smoke rising up from the frying pan) or how turn it upside down without losing half the tortilla in the process. But sooner or later you have to learn (especially if you are Spaniard) and, as you discover quickly, it was much ado about nothing, it's a delicious recipe that allows hundreds of variations and, probably the best of it, it can help you out of any gastronomic impromptu. As the first time cooking tortillas everything feels a bit difficult and strange, so I've taken advantage of Auntie Cris' version of Zucchini Tortilla (like mine but with a potato instead of onions), shooting photos of the cooking process to publish them here as a step-by-step guide. 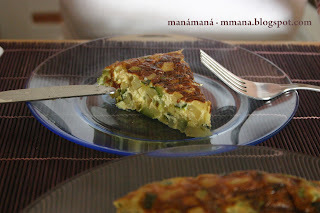 Now you can have a try to cook typical Spanish tortillas with a reliable guidance :)! 1. Before starting, have ready and at hand the mixture you're going to use to cook your tortilla. 2. Remember that usually everybody chooses a frying pan a bit too large for what's needed. If you like think tortillas, use a frying pan a slightly smaller than you'd choose. In case of panic you can always pour the mixture in the cold pan to check the subject before starting. Then clean and dry it and pour olive oil enough to fill nicely the bottom and start the cooking process. 3. When the oil is hot (avoid heating it up too much, when smokes come out of it the oil is spoiled and turns toxic) pour your mixture into the frying pan. 4. If you want your tortilla to be a think one, low the fire after a minute of cooking and put a lid on but a bit lifted in order the vapor gets a way out. This is for avoiding it gets cooked by the outside but stays raw or underdone by the inside. If your tortilla is a thin one, just leave the heat medium or medium-low. 5. You can verify the cooking process of the underside of the tortilla just tilting slightly the pan and lifting the tortilla a bit with a fork. Remember that the center of the underside gets always a bit more cooked than the border. When you like the color of the underside proceed to next step. 6. Retire as more oil as possible tilting the pan and with the help of a spatula (see photo). Why do this? Because if you don't, when you turn the tortilla upside down that oil will get spilled everywhere, and that may include yourself as well. 7. Now get a plate with same or bigger radius than the frying pan and slide the tortilla from the pan to the plate slowly with slow and graceful strokes of your wrist. 8. Then get a plate like the last one and cover the tortilla with it, grip the plates firmly with both hands and turn them 180º quickly. Congratulations! You've turned the tortilla upside down! (That last sentence is used in Spanish to describe a circumstance that has been changed completely ;). 9. Now, with care, delicacy and a spatula return the tortilla to the frying pan. Remember that beforehand you need to pour two or three spoons of olive oil into the pan. 10. Now press the borders of the tortilla with the spatula and use the fork again to check how's going the cooking at the underside. 11. When it's ready slide it to a plate, and voila! Your tortilla is ready to be devoured.